Crispy duck served on a bed of egg noodles in a curry base sauce, garnished with sliced red onions, lime and pickled vegetables. Deep fried prawns with shells (almost like potato chips), sautéed with our special garlic sauce, topped with ground black pepper. 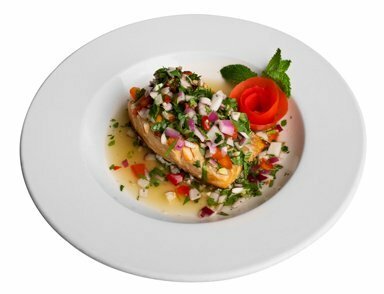 Grilled salmon served under chopped red onions, cilantro, bell peppers in our homemade tangy sauce. Mixed vegetables and bean thread noodle wrapped in a rice paper crepe, then deep fried, served with homemade sweet and sour sauce. Deep fried bean curd, served with homemade sweet and sour sauce with chopped peanuts & cilantro. Meat marinated with homemade fresh herbs and spices, grilled on skewers, served with peanut sauce and cucumber salad (Choice of beef, pork or chicken). Marinated prawns wrapped with bacon and wonton wrappers, deep fried, served with homemade sweet and sour sauce. Chicken wings deep fried until crisp, then sautéed in sweet chili, garlic sauce, topped with crispy basil leaves. Chicken wings deep fried until crisp, then sautéed in garlic, black pepper and seasoning. Deep fried marinated beef, served with homemade spicy sauce. Hot and sour soup with large fresh water prawns, lime juice and lemon grass. Hot and sour soup with catfish, Issan Style. A distinctive soup of sliced chicken with coconut milk, straw mushrooms, galanga, lemon grass and a touch of lime juice. Bean curd soup with ground pork and some vegetables. Chicken wontons, chicken slices and vegetables in chicken broth (Shrimp is B & HP ONLY). Assorted seafood in clear broth with fresh tofu and vegetables. Cellophane noodles, onion, chicken, shrimp mixed with chili and lime juice on bed of greens. Fresh mushrooms, shrimp, onions mixed with chili and lime juice. Grilled shrimp, lemon grass, lime juice, Thai chilis mixed with our secret sauce, served on bed of greens. Red onions, green onions, tomato, cucumbers, cilantro, fresh chilies mixed with homemade sauce, served on bed of greens. Combination seafood, fresh vegetables, chili, lemon grass, and lime juice. Served on bed of greens. This classic dish from Thailand consists of green papaya, chili, tomato, crushed peanuts mixed with lime juice, fish sauce and sugar. Charbroiled whole catfish, served with tangy, spicy sauce & tamarind sauce. Served with tangy, spicy sauce & tamarind sauce. Sliced charbroiled beef mixed with green onions, red onions, cilantro, dried & fresh chilies, lime juice & rice powder. Sliced charbroiled beef served on beds of sliced cabbages, topped with fresh garlic, tangy and spicy sauce. Minced beef with fresh herbs, fresh and dry chili rice powder, seasoned sauce, lime juice; served raw. With curry paste-chicken, egg. sliced cabbage cooked in a bowl. With curry paste-fish, egg, sliced cabbage cooked in a bowl with your choice of catfish. Sliced charbroiled catfish fillet, topped with spicy sauce, served on bed of sliced cabbage. Deep fried whole catfish, topped with sweet, sour and spicy sauce. Deep fried whole catfish, topped with sautéed fresh and dried chilis, garlic and Thai Basil. Deep fried whole catfish, topped with vegetables, lime juice, peanuts, and cashew nuts. This unique Issan style red curry (no coconut milk) is a combination of local vegetables, your choice of chicken or catfish chunks (with skin). Influenced by Lao’s cooking this is another unique curry (no coconut milk) that combined local vegetables, your choice of chicken or catfish chunks in rice powdered red curry base [no coconut milk, but thicker than ‘Kang Renu’]. Fried Thai mussel omelet to crispy on top of sautéed bean sprout and green onion and served with spicy sweet sauce. Sautéed with minced fresh and dry chilis, garlic, bell pepper and Thai basil with your choice of meat. Sautéed with cellophane noodles, tomatoes, black mushrooms, egg, green onion and onions, topped with cilantro. Sautéed with your choice of meat with baby corns, straw mushrooms, carrots and onions, topped with cilantro. Choice of meat sautéed in our garlic cilantro pepper sauce, served on beds of greens. Choice of meat sautéed in roasted chili paste, cashew nuts, and onion. Choice of meat sautéed with fresh ginger, black mushrooms, bell pepper, green onion and onions. Choice of meat sautéed with bell peppers, fresh chili pepper, & onions. Choice of meat sautéed with home made spicy red chili paste and green beans bell peppers & lime leaves. Deep fried thin catfish slices (deboned) sautéed with red curry paste, Kra-chai, fresh & dry chilis thai eggplant, green bean. Sautéed, deep fried thin catfish slices (deboned), in fresh and dried chilis and Thai basil leaves, bell peppers. Sautéed in our garlic cilantro pepper sauce. 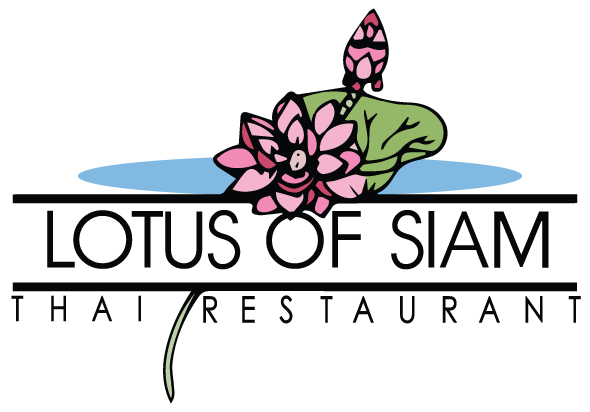 Deep fried whole pompano fish, topped with ginger, onions, and black mushroom sauce. Deep fried whole pompano fish, topped with Thai style sweet and sour sauce. Deep fried whole pompano fish, topped with sautéed fresh chilis and garlic sauce. Steamed combination seafood, with eggs, sliced cabbages, coconut milk and curry sauce cooked in it’s own juice. Sautéed of half shelled mussels with fresh and dry chilis, garlic and Thai basils. Seared scallops topped with our sautéed garlic, cilantro and pepper sauce. Seared scallops topped with homemade fresh chilis and Thai basils. Stir-fried wide rice noodles topped with ground beef, cooked in curry powder, tomatoes, bell peppers, onions and celery. One of the most popular “Boat Vender” beef soup in Bangkok, consists of thin and flat rice noodles, Thai style beef ball and beef in seasoned beef soup. Similar to the Combination Beef Noodle soup above, but only with Thai style beef ball. Pan fried flat rice noodle topped with, sautéed assorted seafood with fresh & dry chili, Thai basils served on bed of greens. Stir-fried egg noodles with tomatoes, fresh & dried chilis, and assorted seafood. Pan fried egg noodles in our own special sauce with egg, chicken, shrimp and tomatoes. Stir-fried with eggs, onion, tomato. The color and flavor of fresh & dried chilis make this curry a unique dish. Cooked with coconut milk, Thai basils and chili, with your choice of meat or tofu. The food from the north is as distinctive as its culture. Northern dishes are generally more milder than those of central and northeastern Thailand. The influence of neighboring Myanmar (formerly Burma), Chan, Chieng San, Laos and South China (Hunan), is present in of these most popular dishes from our small kitchen to you. The flavors of the north are similar to the environment of Chiang Mai. Chiang Mai consist of herbs and greens, more of a beautiful mountain scenery with a touch of spices that will leave the mind filled with memories. This northern Thai style sausage packs quite a bit of heat, stuffed with ground pork, fresh and dried herbs and spices, these mild-medium spice sausages will be sure to give a kick with every bite. This local dish from the north is unique to the northern part of North Thailand. Made of shredded young jack fruit, ground pork, tomatoes, northern Thai spices and seasoning. For those of you who love the texture of the heart of artichoke and spicy food, have we got a dish for you. This northern style curry is made of young jack fruit chunks which is the similar texture to the heart of artichokes. This dish cooked in northern style curry base, fresh and dried spices and your choice of pork, chicken or smoked sheet-fish flakes. This classic northern Thai dish is very popular among vegetarian around the Northern border, served with fresh vegetables. A unique pork stew with tomatoes, ground pork, pork blood chunks and some spare ribs covering a bed of rice vermicelli noodles, garnishing with fried dry chili, lime and fresh bean sprout and sliced cabbages. This dish is very popular among the locals along the northern border. Roasted green chili, garlic, onions and tomatoes pounded in a mortar. One of the most popular dips of northern Thailand, eaten with *sticky rice, fried pork skins and fresh vegetables. (Medium hot and up). One of the least spiciest of all northern chili dips. A combination of ground pork, tomatoes, dried spices (similar to spaghetti meat sauce). Also eaten with *sticky rice and fresh vegetables with fried pork skins. Similar to Kang Renu Nakorn, this home style non- coconut cream red curry from the North is a combination of fresh, aromatic vegetables, spices, herb and your choice of chicken, pork or catfish chunk, but with more vegetables and some difference herb and spices. Assorted vegetables fresh and dry spices and herb, clear noodle, pork all mixed in to this dish. This is also one of the “Temple Dish” or street vendor choice and it is a well consumed dish among Northern Thai people. Difference from the “Bangkok” style Tom-Kah-Kai (#23), this northern home style chicken soup has no coconut cream. Cooked with roasted green chili, tomato, onion, fresh herb and spices. Deep fried lobster, sautéed with our special garlic sauce. 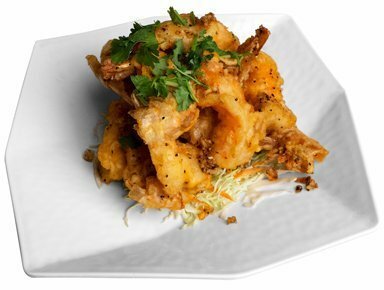 Deep fried prawns sautéed in our fresh homemade chili and Thai basil sauce. Served on top of pan fried flat rice noodles. Steamed sea bass topped with our special spicy chili sauce. Served on top of steamed vegetables. Steamed sea bass topped with somthum which consists of green papaya, chili, tomato, crushed peanut mixed with lime juice, fish sauce and sugar. Steamed sea bass, egg, sliced cabbages, coconut milk and curry sauce cooked in it’s own juice. 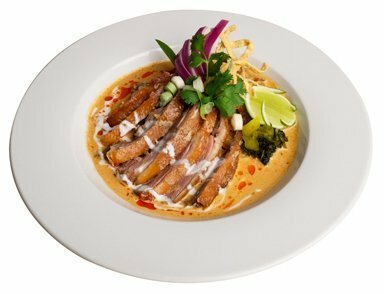 Crispy duck topped with Thai style red cream curry sauce with cognac. Deep fried whole red snapper topped with homemade fresh chili and Thai basil. Deep fried whole red snapper topped with sweet, sour and spicy sauce. Deep fried whole red snapper topped with with Thai style red cream curry sauce with cognac. Charbroiled chicken or beef topped with special peanut sauce on beds of asparagus.